Happy National Ice Cream Day! Summer Ice Cream Round Up: 2015! It’s muggy and icky warm today, here in sunny California and ironically, the PERFECT setting to indulge in America’s favorite dessert: ice cream! And since I (unfortunately) won’t be back up and baking up anything new until early September, I’m determined to become the Mistress of Ice Cream. Which will (hopefully) result in epic brownie points from my Daughter and Husband. Which is the BEST reason of all for this massive Summer Round Up of Ice Cream loveliness! So to kick off my first Round Up Series on the blog, I’m delighted to be sharing a few of the most delightfully, cool-tastic Ice Cream recipes! From blogger friends near and wide! Who know EXACTLY the right way to beat this summer heat! First up in my Summer Ice Cream Round Up, is this GLORIOUS Frozen Banana Split Cake from one of my Mommy blogger friends at Dinner at the Zoo! Even though I’m not personally a huge fan of bananas, here’s what I LOVE about this cake, besides how pretty it is: not only does it incorporate 3 (yes, THREE ice cream flavors) within these 4 perfect layers of banana cake but it also has sprinkles! Sprinkles, my friends! I doubt there’s a soul alive who doesn’t like a good sprinkle garnish! So RUN, yes, RUN to the grocery store to stock up on these 3 ice cream flavors! 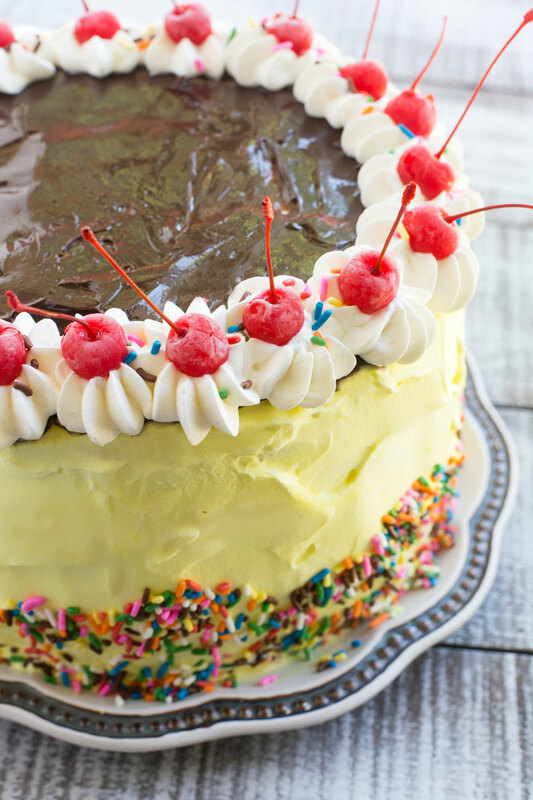 This cake is all you need for show stopping, ice cream bliss! Thank you, Dinner at the Zoo, for this beautiful, summer masterpiece! 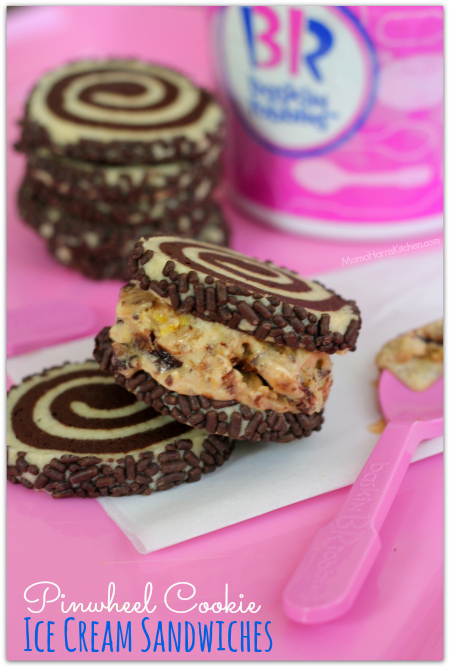 This 2nd featured recipe, Pinwheel Cookie Ice Cream Sandwiches, is by another of my Mommy blogger friends, at Mama Harris’ Kitchen! And oh my sweetness, this ice cream sandwich looks to die for! I love, LOVE ice cream sandwiches (though I’ve never attempted to create one of my own), and could quite possibly indulge in them every single day. Which unfortunately, would not agree with my Menopausal lifestyle right now. Not one bit. However, THIS tantalizing little sandwich has everything I like most about kitchen wizardry: homemade cookies with chocolate AND sprinkles, as well as the most creative ice cream flavor combination from Baskin-Robbins, that I’ve ever heard of. Potato Chips? Pretzels? Caramel? Yes, please! So really, what are you waiting for? There’s no way you can wrong with cookies and ice cream! Who’s ready for ice cream and CANDY? Yes, I did just say candy! Mama Harris’ Kitchen ALSO has another sweet summer treat, Zours Candy Ice Cream! 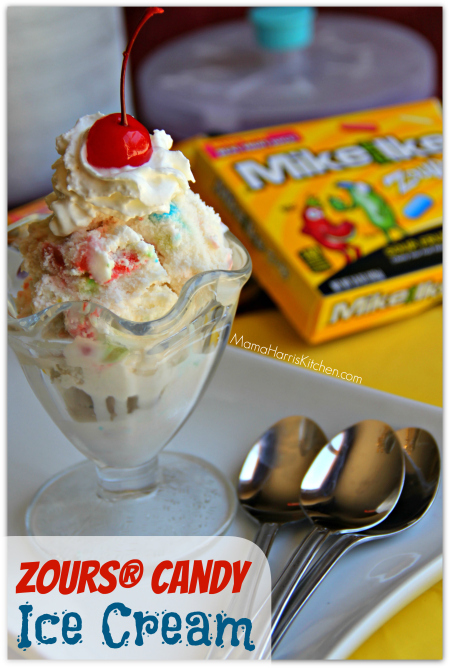 Incorporating one of my husband’s favorite movie theater indulgences, Mike and Ike’s Candies! Which he buys nearly EVERY time we’re able to spend some quality time at the local theater. And considering how quick and easy this recipe is to create, it’s very likely that this ice cream recipe will undoubtably become my husband’s best friend this summer. So much thanks, Mama Harris, for this perfect family treat! 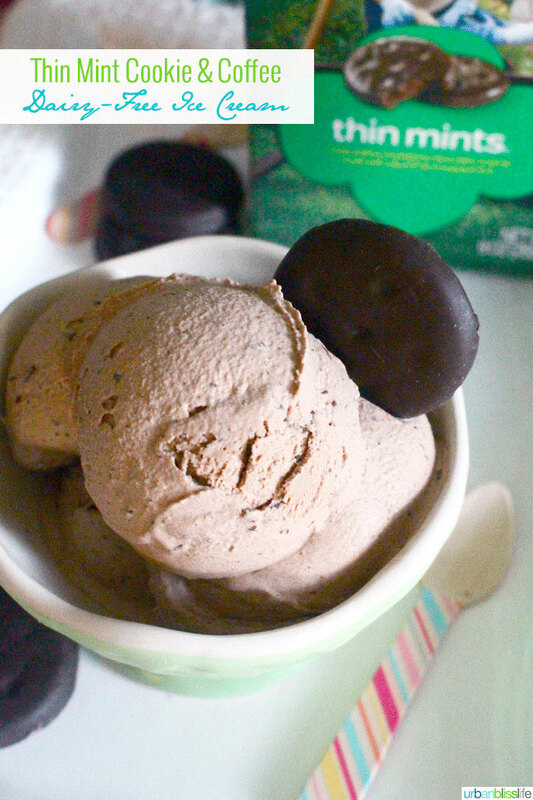 Now THIS Thin Mint Cookie and Coffee Dairy-Free Ice Cream from Urban Bliss Life, is ALL for me! Must I even explain why?? Coffee, my friends. Coffee. With cookies. The perfect companion to my semi-regualr book reading Sunday afternoons. Hot coffee is not always a good idea for warm summer days with a side of hot flashes. A favorite morning obsession of mine that is generally frowned upon in my family (out of love, though, rather than criticism). So this homemade coffee ice cream should be very happily received from now on. Sundays or not. Thank you, Urban Bliss Life, for this delicious ice cream recipe! You’ve officially saved my Sundays! Last up in my Summer Ice Cream Round up? 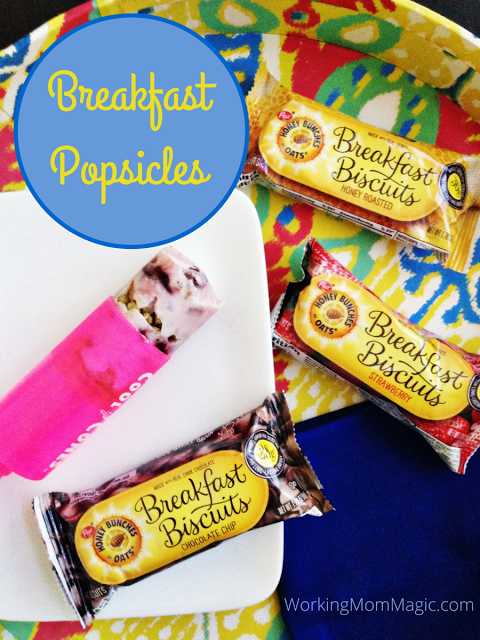 These delectable looking Breakfast Popsicles from Working Mom Magic! Being a working mom myself (with two of my own weekend businesses), I truly appreciate fast, easy breakfast ideas for my 2-1/2 year old Daughter. And this Breakfast Popscicle, with all of it’s Honey Bunches of Oats cereal, fresh fruit, and yogurt GOODNESS, is right up my alley! Because what busy Mom (working or not) doesn’t want something healthy AND yummy for their ever blossoming kiddos? I, for one, cannot wait to try my hand at this kid-tastic recipe! Tonight, perhaps! From the kitchen of this Mama to yours, many thanks to Working Mom Magic, for this much needed post! See anything from these featured recipe posts that you like? Which one will you be whipping up tonight? Happy National Ice Cream Day, my friends! Hope you’re keeping it cool! « Happiness Project Recipe #65: Rainbow Cheerio Yogurt Pops! I LOVE this round up! I did one on my blog too! Ice cream is by far the best dessert there is! Ooh that thin mint one looks mighty tasty! As we speak im waiting for my roommate to bring me froyo home (i sprained my ankle and am stuck in bed! ), but I did enjoy national ice cream day yesterday with a visit to coldstone! !